The latest version of Greenpois0n has been released for download, it offers an untethered jailbreak for iOS 4.2.1. The Mac and Windows release come as GreenPois0n 1.0 RC5, with a Linux version due out soon. If the initial download link does not work, be sure to try one of the mirrors. We will update download links when they become available for all platforms. Follow our how to jailbreak iOS 4.2.1 untethered with GreenPois0n 1.0 RC5 guide if you need assistance. As usual, backup your iPhone before proceeding. If you are currently using a tethered jailbreak like redsn0w, you should restore before jailbreaking again with GreenPois0n 1.0 RC5. Update: For those encountering a problem where the app stalls on “initialized”, you can download GreenPois0n RC5 2 to resolve this. Update 2: The Windows version of GreenPois0n Untethered will be released tomorrow or the next day, according to p0sixninja. We will update download links for all versions of GreenPois0n as they are available. Update 3: GreenPois0n RC5 for Windows has been released. It supports the untethered jailbreak for iPhone, iPad, iPod touch, and Apple TV2, running iOS 4.2.1. Mirror 2 seems most reliable at this point. When will the WINDOWS version release>>?? The file on the MediaFile site is crap and hangs! when will green poison come out for windows???? Hi matt i have windows it works fine. It is just released like 3 minuits ago. the website wouldn’t load for like a minuits because they were updating it. the linux version is still yet to be released. And… where will the linux version available? IVE JUST INSTALLED GREENPOISI0N 4.2.1 JAILBREAK ON MY IPOD & IT WORKS THANKS MUCH TWO THE TEAM WELL DONE. Hi Rapompo ive downloaded Greenpoisi0n from the website called OSXDAILY & it free. Sorry Rapompo iam using Google page I typed in GreenPoisi0n Untetered Jailbreak for ios 4.2.1.On the first page second one from the bottom it should say 3 feb 2011….The lastest version of Greenpoisi0n. DOWNLOAD AVAILABLE. Best of luck. Hi Rapompo the web page you need two type in is. http://osxdaily.com/2011/02/03/greenpoisi0n-untethered-jailbreak-for-ios-4-2-1-download/ Yes you have two download and save the program called gp_win_rc5_b2 (4).zip file. i install cydia using green poison ios 4.2.1 on my iphone 3gs. everything is ok BUT inserted t-mobile SIM it dosent work, did i miss some step or what else i have to do. please help. thanks. 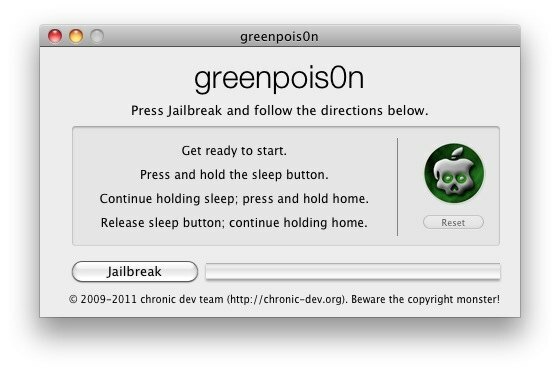 I have a unlocked/jailbroken iphone3 with cydia, can i still download this green poison for my phone? ive downloaded the greenpoison RC5 and RC6 and did the DFu but after every time i do it is says try again – someone please help!!! ive tried a 1000 time keeps putting it back in restore mode. yes I have turned off fire walls/antivirus running xp i have new verizon 4 4.2.1. Any love would be appriciated?? How long does it take to jailbreak my iPhone 3gs? same thing, got cydia app, but wont open. Any help? how do you do this? please explain. how do you do this for ipod touch?